Tips and Tricks: Bunny Pops! 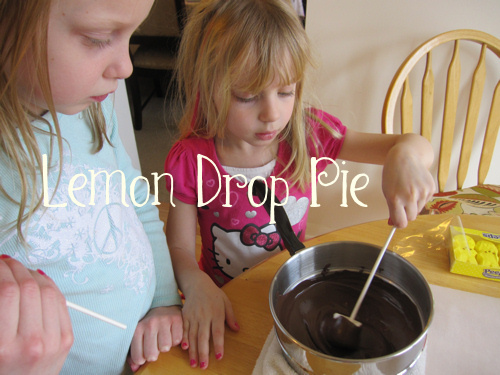 Last week I tried to make cake pops for Tips and Tricks Tuesday. They were a disaster. I made the cake crumbs too small, added too much frosting, and didn’t have a proper holder for the cake pops to dry after I dipped them. They tasted horrible (too much frosting, not enough cake) and they kept falling off the sticks. Since the cake pops weren’t cooperating for me, I decided to go with marshmallow pops for an easy Easter treat instead. I had a lot of success with Candy Corn Marshmallow Pops for Halloween, so why not? Melt the dark chocolate candy melts with a double boiler or in the microwave. 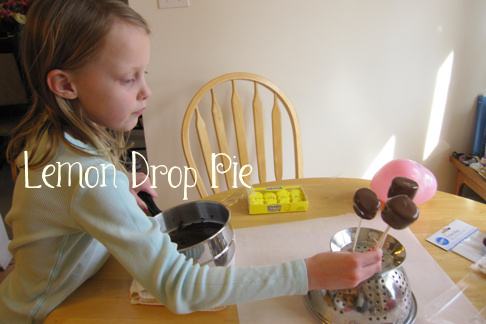 Dip the marshmallows in the chocolate and allow the candy to set completely. While the chocolate is setting, prepare your green chocolate. Using a kitchen shears, snip the heads of the bunny peeps off of the body. Feel free to sing “Little Bunny Foo-Foo” as you snip (for field mice revenge). We used a small colander to hold some of the pops, but it didn’t hold that many, so I also placed some in water glasses. When the chocolate is set, dip the tops into green candy melts. I thought it would be cute to add green coconut also, but I didn’t have any. (Typical!) Press the bunny head into the green candy and let it set. 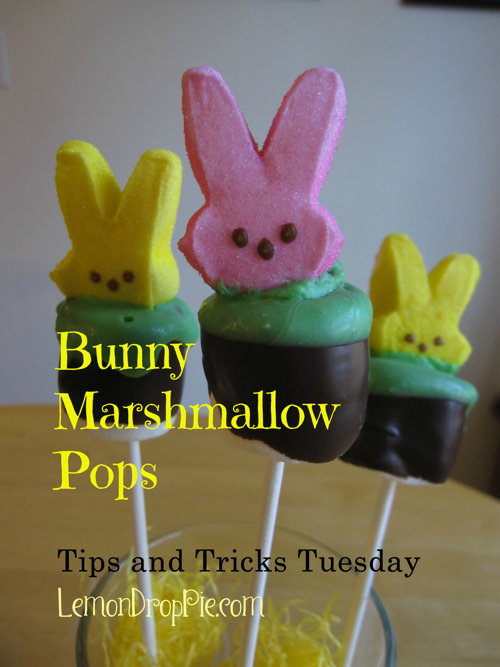 11 Responses to Tips and Tricks: Bunny Pops! fun! these look great! thanks for linking up with Pin It Tuesday! Hope to see you back next week!! 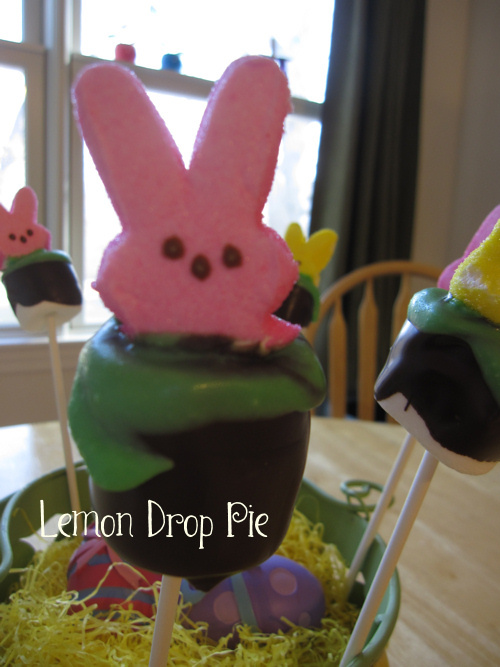 Ok I hate peeps but those are so cute I might have to make them! They look amazing! I feel like my husband would be better at these since he has more diligence but you give great tips! The singing of "Little Bunnie Foo-Foo" is definitely going to happen. LOL! Both marshmallow and coconut have an either you love 'em or hate 'em thing going on. My recent post Tips and Tricks: Bunny Pops! The girls did have a lot of fun. They love dipping things into chocolate! These turned out so cute! Shared them on my Spring Board on Pinterest! Thank you for sharing, Barb!